“With great power must also come great responsibility.” That singular phrase is what writer Nick Spencer and artist Ryan Ottley were entrusted with when they took their respective torches from Dan Slott and his menagerie of collaborators during his run on Marvel’s flagship masked hero. This undertaking held a great deal of significance for “webheads” the world over, as it had been a long wait indeed for the wall-crawler to return to his roots. Does Amazing Spider-Man #1 deliver? Well, take it from a longtime webhead: Spencer and Ottley come out swinging. Some perspective for those perhaps not so in the know: You know who Peter Parker is, how he got his powers (there was a spider, and his uncle and stuff happened), and if you know anything else about the character’s storied history I’d be willing to bet folding money that you know about Mary Jane Watson – the red-headed bombshell that is forever his love and rock. There are great significance and weight to the likely fact that even most people who aren’t educated in all things Spider-Verse know of MJ because for an excruciatingly long time it felt as though the head honchos at Marvel Comics had forgotten that very foundational piece of Spider-Man’s existence. There are couples in comics that you just know go hand-in-hand: Lois Lane and Clark Kent, Scott Summers and Jean Grey, and Peter Parker and Mary Jane Watson – it was simply point-of-fact. In the waning months of 2007, however, that all changed, and not for the better. Members of any fandom can be split on virtually any given thing by relatively even margins (with some exceptions here and there, of course): the quality of the DCEU films, the direction of Disney’s current run with Star Wars, the Spider-Man Clone Saga, or any number of other scenarios. In all of those, one can find a general defense, at least at a base level, for both sides of the issue. One thing that can be nigh axiomatic among Spider-Man fans, however, is the sheer repugnance and vitriol for former editor-in-chief Joe Quesada’s One More Day. In the aforementioned title, Quesada brought to life his hatred for the idea of Peter and MJ by having Peter make a deal with Mephisto, the King of Hell, in which he would have to give up his marriage to Mary Jane in exchange for saving the life of his dear Aunt May. Then-editor-in-chief Quesada, apart from his own distaste for the couple as a whole, misguidedly believed that Peter being married was bad for the character and that, by way of erasing said union from the timeline, Marvel would, in essence, keep the character young and more attractive to readers. Despite this being the furthest thing from the truth, One More Day happened and fans cried foul, and even though the next few years brought with them some amazing fantasies with Big Time and Spider-Island, among others, the character was missing something and fans knew exactly what it was. Then the unthinkable happened and long-time Spidey nemesis Doctor Octopus seemingly killed his rival and Peter Parker was gone, his body subverted by the consciousness of Otto Octavius. Now in the body of the masked hero, Otto set out to prove himself capable of being the “Superior Spider-Man” by not only defeating much of his enemy’s rogues gallery, but also designing far superior tech with which to continue his victories against New York City’s biggest and baddest supervillains, not to mention obtaining Peter’s unfinished graduate degree (we’ll revisit that later). Ultimately, Peter’s consciousness regained control of his body and was once again the web-slinger. Dan Slott’s run when the Amazing Spider-Man returned brought much of the series back to familiarity while retaining a host of the new plot elements and growth that came from the Superior Spider-Man saga, and the character received some much-needed evolution to keep things fresh; still, something was missing and fans knew exactly what it was. Fast-forward through an assembly of multiversal wall-crawling, extinction-defying events, and a riches-to-rags tale and we arrive here at Nick Spencer’s Amazing Spider-Man #1. From the outset, the 48-page special knows what it needs to do: pay homage to the past, and it gets right to work by spectacularly harkening back to 2007’s Sensational Spider-Man Annual #1, by Matt Fraction and Salvador Larroca. 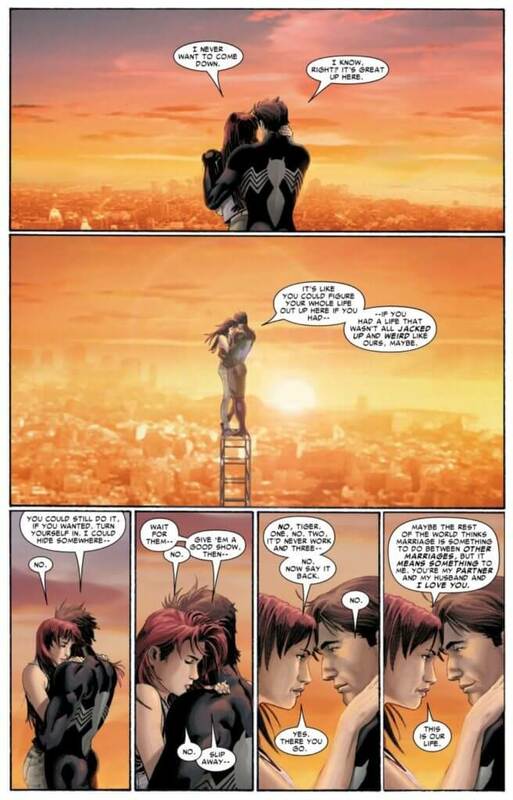 This story showcased and emblazoned the love between Peter and MJ in the aftermath of Spider-Man switching sides in the Civil War from Iron Man’s to that of Captain America. It takes only the first two pages of Amazing Spider-Man #1 to realize that Spencer himself was a fan and he knew exactly what had been missing. *Spoilers* Peter Parker is broke. No more CEO, no more worldwide adventures – just your friendly neighborhood Spider-Man. He’s splitting rent with the son of Daily Bugle editor (and his boss) and a guy who happens to also be a supervillain. The old “Parker Luck” is back in full swing, pun intended. And that’s not hyperbole either, as things go from bad, to really bad, to worse very quickly for our favorite wall-crawling hero. On top of having lost the trust of the Avengers and all of his other superhero pals (he struggles to earn any footing with even the closest of his former allies as they all attempt to fight off a seemingly infinite swarm of deadly bugs in the streets of NYC), he comes under review for accusations of plagiarism in one of his graduate school papers that a new cheat detection program called “WATCHR” tagged as being written by none other than Otto Octavius (which is technically true if you recall the aforementioned body-swap escapade; as body-swap stories go, I must say that one was superior). These accusations are enough to not only lose him his position as science editor at the Daily Bugle but earn him disdain and disappointment from Aunt May. “There goes the neighborhood,” as it were. The second sign to which Spencer has been paying attention comes in the form of a flashback while Pete is still fighting off the invading insects. Upon telling Mary Jane of the plagiarism charge, the two share a moment of mutual longing – they both know that something has been missing. One of the panels here is a tear-jerker for those paying careful enough attention, as artist Ryan Ottley focuses in on MJ’s delicate hand that is missing the ring that once rested upon it. Peter makes a final attempt at ending the apparent invasion by leaping towards what he believes to be the primary portal from which these insects are inexhaustibly pouring. He reflects on his choices, good and bad, and resolves to end this fight – whatever the cost to his own life – until he smacks into the glass cockpit of Mysterio’s ship, much to the master illusionist’s incredulity, and quickly ends the conflict and assault on his city. If that wasn’t unexpected enough, as Mysterio hangs prostrate in a web cocoon and diatribes about wanting to turn his “lousy life around” and “go for the brass ring” by committing mass murder (supervillain logic – real scholarly stuff here) in lieu of repeating the same old tried-and-failed plan ad nauseum, Peter has a revelation. Having thought that he may once again die in the line of duty and not knowing what he’s living for, he at long last realizes what has inexorably been missing for so long. Web-slinging over to Mary Jane’s apartment, Peter allows to pour out of his heart everything that had been weighing it down for what felt like ages. He tells MJ that through everything that he’s been through, body-swapping, transdimensional crime-fighting, and world-saving, he’d never have made it through any of it without her. He realizes that, regardless of all of his powers and abilities, he needs her more than anything to be able to do what he does and to do it right. And before he has a chance to second-guess himself and turn away, Mary Jane pulls him in for a soft kiss and a warm embrace, assuring him that they’re in this together, forever and always. Something had indeed been missing for a long time, and they finally both knew exactly what it was; watching that revelation play out is something truly amazing. The Amazing Spider-Man #1 is a much-needed union of the classic story feels and reunification of the scarlet wall-crawler with his ruby-haired love, and plot twists that make the reader double-take and wonder how much second-guessing they’ll be doing in the months to come, as Nick Spencer clearly has every intent on marrying what we love with the unknown and unexpected. 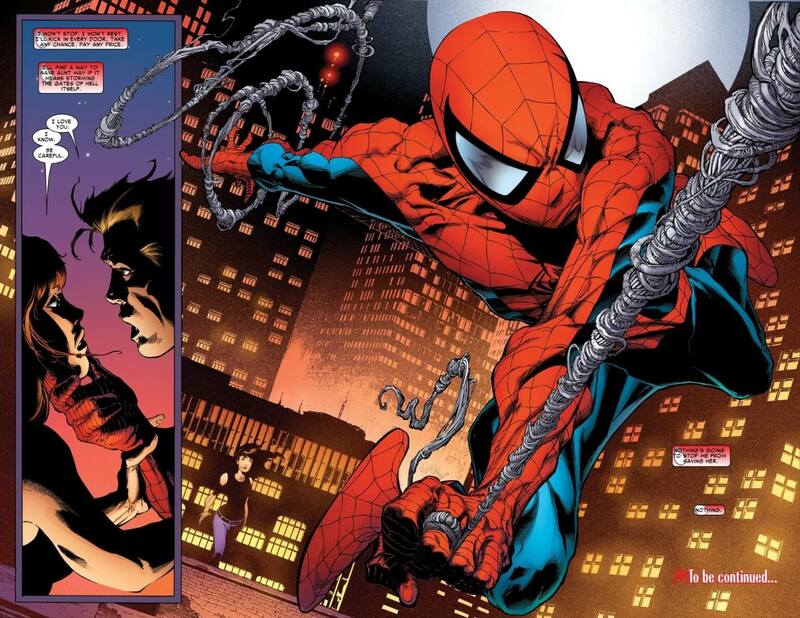 The inaugural issue of his run does, with precision, what it needs to: tell fans that Pete and MJ are a thing again and are supposed to always be, play with the most interesting plot points from Dan Slott’s run and use them as tools for the characters moving forward – thereby keeping them familiar yet growing, as opposed to stagnant – and throw a healthy monkey wrench or two into what he predicts readers’ assumptions may be to keep us synchronously off-balance and on our toes, genuinely interested and eager for what the next page holds. This penchant for shockers is on full display in the book’s final pages as we get a tantalizing hint at what yet may come for our hero. The Amazing Spider-Man #1 is a charming return to what fans love most about Spider-Man: he’s human and makes mistakes, life seems to enjoy cosplaying as a monkey in a zoo with all of the crap it throws his way, and – arguably more so than the lion’s share of characters in the Marvel Universe – he’s grounded (for someone who swings through the skies on webs… err, indulge me and just go with it?) and the bulk of his adventures occur within the confines of New York City when taking on his rogues gallery – think the Batman of Marvel, in that sense at least, he’s at his best when he’s doing his own thing on his own turf. Spencer’s pin-point writing sticks and I think that as he continues his run and settles into the characters, it will only get better. One of my favorite highlights of the Spider-Man runs of recent years has been the sensational pencils of Humberto Ramos, and it was a real treat to see him give readers a 10-page dessert at the end of the book, but Ryan Ottley’s simplistic style lends itself well to the stories that are being told. We’re going back to basics and there is a noticeable lack of clutter on the page to complement that theme. That said, I wouldn’t exactly shake my fist at the heavens if Ramos graced us with his pencils on a regular basis. Tonally, The Amazing Spider-Man #1 brings a sense of great expectations for what is in store, and while, truthfully, not a lot actually happens, there is crucial character growth that sets the stage for the coming issues. I would definitely recommend any fan of the wall-crawler who was perhaps disenfranchised with his last few runs to pick this book up and give it the once-over; I did and was not disappointed. So swing by your local comic book shop and support them by picking up a copy of this great return to the familiar. If you enjoy it as much as I did, add it to your pull list and look forward to what lies ahead. The amalgamation of Nick Spencer's and Ryan Ottley's clear love and respect for the character's, their history and lore, combined with their talent for making the old new and exciting, and an easy story to jump into for those who haven't read a Spider-Man comic before makes this an amazing book to pick up.